Jomar is proud to announce that the IntelliDriveTM Model 135 is now commercially available. The IntelliDriveTM Series is Jomar’s new line of injection blow molding machines that use up to 50% less energy* than the standard hydraulic machine and demonstrate several other features that result in decreased utility costs and increased production. The IntelliDriveTM machines made their debut at the K show in Germany last year with the premier of the 85S. This machine was well-received and purchased at the show by a European manufacturer that was seeking to capture higher efficiency and energy savings. 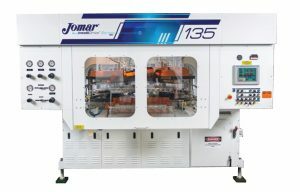 As the workhorse machine size for the US domestic market, the Model 135 is a welcome addition to the Jomar product line. The IntelliDriveTM Model 135 has a dry cycle time of 2.5 seconds, compared to 3 seconds from comparable IBM machines from other manufacturers and requires 40% less hydraulic oil and tower water than the standard Model 135 machine. The servo-driven hydraulics of the IntelliDriveTM allow the machine to consume only the amount of energy that is required for the process. The rate may be higher or lower depending on factors such as the resin, bottle size and cycle time, but the average running power consumption of the IntelliDriveTM Model 135 is only 35.7 kW per hour. For more information about the Jomar IntelliDriveTM series, click here.